It’s a crisp, clear morning, and with the Swedish summer quickly coming to an end, there won’t be many more days left like this, so it’s a perfect time to wander through Stockholm’s lake country. It doesn’t take long to realize why Swedish immigrants were drawn to the similar terrain of Minnesota. Familiarity, after all, breeds comfort. Over the years, few products have seemed more familiar than those from Volvo. Even those with weak eyesight could spot the brand’s boxy silhouette from 1000 yards. Those drawn to Volvo products wanted simple, safe, reliable transportation. Styling was superfluous. It was a formula that ensured a steady, though modest stream of customers. But even before the Swedish marque was sold to Ford Motor Co., with its massive engineering and marketing resources, Volvo was looking to expand demand and grow beyond its semi-cult status. 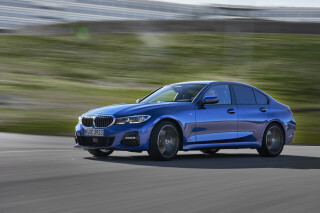 The first hint this change could be achieved came with the introduction of the top-line S80 sedan, quickly followed by the C70 coupe and convertible. Mere aberrations? Not at all. Though the recently added V70 wagon maintains the traditional box shape, the latest addition to the lineup is clear proof Volvo is designing to a different drummer these days. The S60 sedan shares the sleeker styling "vocabulary" introduced with the S80. Indeed, at first glance, you might mistake the two vehicles, which share platforms and numerous components. But there are some notable differences that permit Volvo officials to use words like "performance," and "fun-to-drive" to describe the S60—and not have to cross their fingers behind their backs. "The challenge was to compress the interior into the (C70) coupe’s slender lines," explains chief designer Geza Loczi. The S60 is broad shouldered, with a flowing roofline that is indeed quite coupe-like, yet even a strapping Swedish six-footer can fit comfortably, front or back. 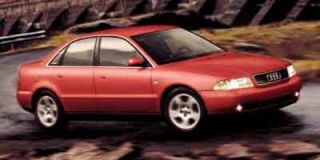 The sedan has a little less of the Coke bottle shape of the S80, and there are subtle changes in signature details, such as the taillights. 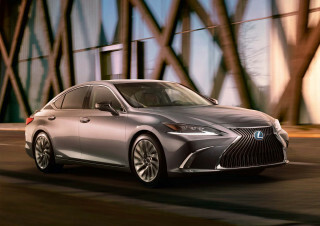 Proportionally, the new sedan boasts a longer wheelbase, with shorter overhangs. That serves several purposes, providing more useful interior space, and enhancing dynamic stability. Volvo clearly targeted BMW, which remains the benchmark for "driving machines," and while the smooth Stockholm terrain didn’t provide many opportunities to push the S60 to its limits, we had enough wheel time to be impressed with the car’s handling and performance. 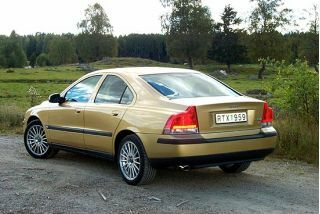 The S60 is solid and stable, handling with aplomb a tight slalom course Volvo set up as a route detour. Steering is precise, with just the right amount of boost. During a day of driving, we had the opportunity to switch between all three S60 models coming to the states. We started the morning, appropriately, with the base car, which features a 2.4 liter, normally aspirated five-cylinder engine rated at 168 horsepower. It’s a torquey little powerplant that moves surprisingly fast off the line. The mid-level engine, the light-pressure turbocharged 2.4-liter engine brings the pony count to 198, while the high-pressure 2.3-liter package delivers a solid 247 hp, more than enough to surprise those who can’t imagine a Volvo spinning its wheels. Those looking for the maximum thrill would be strongly advised to consider the T5, with its high-pressure turbo and stiffer suspension, then add the optional, 18-inch, low-profile tire and wheel package. The U.S. version of the T5 will offer an optional "Space Ball" five-speed stick, a futuristic looking aluminum-and-leather shifter. We found the manual transmission smooth and easy to manage, and a definite performance enhancer. Though smaller than the S80, Volvo’s design team has used cab forward engineering to maximize passenger space. Those up front have plenty of leg room, though the passenger side is a bit narrow. Rear seating is ample for a car of this class, though more cramped than the S80. As you’d expect, the seating is comfortable, with the front buckets enveloping you like a glove. They keep you firmly in place, even on the twistiest roads. The optional sport package offers similar seats for the outboard rear passengers, as well as a usable middle rear seat. The look and feel of the interior underscores Volvo’s drive to reposition itself as a luxury brand. The materials are sumptuous, with well-matched colors and textures. 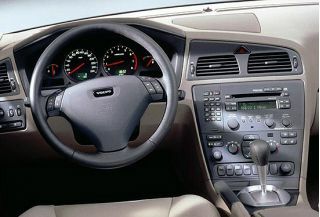 Gauges are easy to read, especially the optional navigation system. Competitors typical mount their nav monitors in the center console, forcing you to take your eyes off the road to check directions. When in use, the Volvo screen pops up from the top of the center stack, minimizing eye movement. Directions also can be read out in a friendly, digital voice. Though the emphasis is on ergonomics, we found some controls confusing, especially on the sound system, though otherwise, it’s a great package. 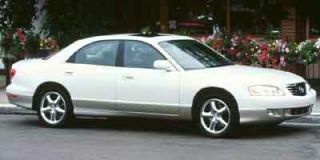 We especially appreciated the optional, 13-speaker Harmon Kardon package, with its in-dash, six-CD changer. Navigation control buttons, hidden on the back of the wheel, also take time to become familiar with. We did have one complaint we hope to see Volvo address quickly: the position of the automatic gearshift lever did not match up to the PRNDL display alongside. We had to rely on a dim LED readout to see what gear we were in, which could create confusion for a motorist not paying strict attention. The S60 isn’t quite as quiet as a Lexus, but that’s scant criticism. Even at 80, it’s easy to hold a normal conversation with passengers in the rear seat. We found the car more prone to road noise than wind noise, especially on rough surfaces. Volvo maintained its traditional emphasis on safety. The S60 is loaded with examples, ranging from the "catcher’s mitt" seat, designed to reduce whiplash injuries, to the separate head and thorax side-impact airbags. With the debut of the S60, the automaker also rolls out its new Volvo On Call system. It operates much like General Motors’ OnStar service. Press a button to call for help, or guidance, or even to unlock a car door should you inadvertently leave your keys inside. The system will even place the call itself in the event of a serious accident. And Volvo adds a neat trick with the On Call system. In case you’re in an area without cell phone service, it uses a back-up satellite link with the Volvo emergency center. For "green-minded" motorists, the base engine is Volvo’s first to qualify for ULEV (Ultra-Low-Emission Vehicle) status, and all models feature the unique PremAir radiator. A special coating actually breaks down smog-causing ozone in the ambient air, simply by driving. There’s a standard cabin air filtration system, and an optional upgraded package. Overall, the Volvo S60 is an impressive vehicle. It’s roomy, comfortable and surprisingly nimble. 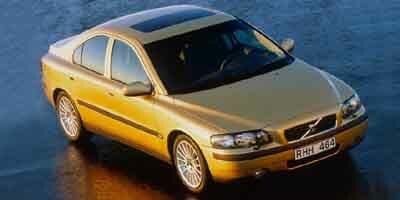 Its sleek shape may shock Volvo purists, but there’s little sacrificed, and plenty gained. 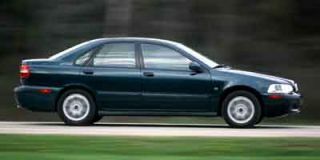 And considering Volvo has cut the base price off the old S70 by $1000, it’s certainly worth putting the new S60 on your shopping list. I love this car.If you've never sat in old Volvo seats, you don't know what comfort is - I can easily drive nonstop for hours on end without any complaints in comfort. Everything is where it should be, nothing... I love this car.If you've never sat in old Volvo seats, you don't know what comfort is - I can easily drive nonstop for hours on end without any complaints in comfort. 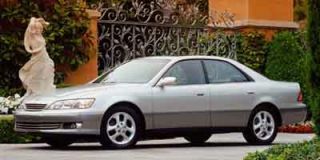 Everything is where it should be, nothing is too complicated, and overall the car is very polite and welcoming. Sure, a couple of the plastic pieces are a little cheap (the driver's door handle broke off recently and the cruise control button doesn't work), but even these somehow feel endearing and lovable rather than cheap, as they would in other cars. This car's performance is great, especially given how heavy it is. 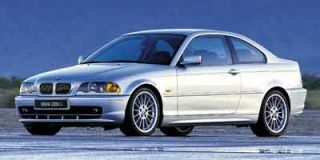 With a couple hundred horses in the turbocharged flat five, it has no trouble keeping up on the highway, in winding corners, or from a stop (0-60 takes about 6 seconds). The handling, too, is perfectly in character: not too tight and aggressive, it leaves you space to sneeze and not drive into a tree, but will still do exactly what you want with a subtle flick. Overall, the car lets you know that it isn't what you would call light, but still will happily get you up to speed without any hesitation (except for turbo lag, which is normal and predictable). One predictable weakness of the car is its low gas mileage. As I've mentioned many times already, it's a heavy piece of machinery, and thus I'm lucky to get 25 mpg in the summer and maybe 22 in the winter. However, with semi-careful driving, highway mileage jumps dramatically, offering up to maybe 32-33 mpg on the interstate.